In today’s post: Learn the right way to take in a shirt so you can make a large shirt smaller and still have it look great! Plaid flannel shirts are back! It feels like high school to me when I see all this plaid in the stores. Of course, not many of us are wearing our flannel with Doc Martens anymore (remember those days?). I’ve purchased a few comfy plaid flannel shirts, and I have one beef with them: flannel shrinks, so after a few washes the shirt still fits fine in width but ends up just a little too short. My solution? Buy larger men’s shirts at the thrift store and take them in for the perfect fit with a little extra length. Today I’ll show you how to take in a shirt the right way. It’s pretty simple! 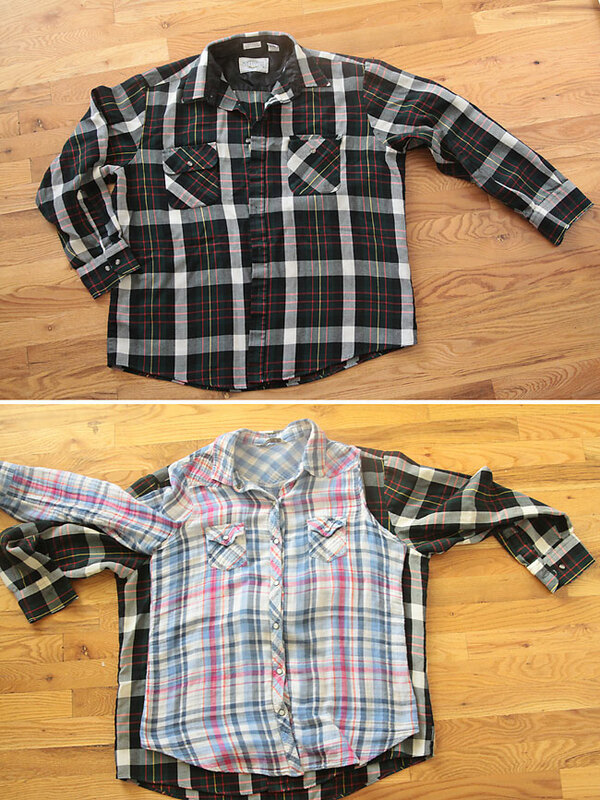 Take a look at the before and after of my flannel shirt. It always seems like I should just be able to wear an oversized shirt and have it look cute – it sure looks cute when girls on TV do it – but no, it doesn’t turn out that way. Oversized shirts just make me look, well, oversized. As you can see from the before photo, the arms are too wide, the body of the shirt is too wide, and the sleeves start too far down on my shoulders. I’ve seen plenty of tutorials on taking in a shirt that tell you to just sew up the arms and back down the body – but you’ll actually get a much better fit (and more mobility in the arms) with the method for taking in a shirt that I’ll show you today. I like my new shirt – it’s just long enough to cover my backside when I wear skinny jeans. Lay your oversized shirt down on a flat surface, smoothing it out flat. Place a shirt that fits well directly on top of the larger shirt, making sure it is smoothed out completely flat and not bunched up anywhere. Pull the sleeve inside the shirt as shown above so you can see the “scoop” of the armhole. Trim away the excess on the other side as well, making sure they match. Next you’ll want to cut down the sleeves. Lay your guide shirt on the ground, this time smoothing out the sleeve. You’ll see that at the armhole seam the sleeve makes an S shape. It’s important to smooth and spread that out as much as possible, then use that as a guide for cutting your new sleeves. When you cut new sleeves from the oversized shirt, don’t cut through the cuffs. Most men’s shirts have two buttons on the cuff so even if they are a little large you can just button them a bit tighter and not have to worry about trying to sew them back together. 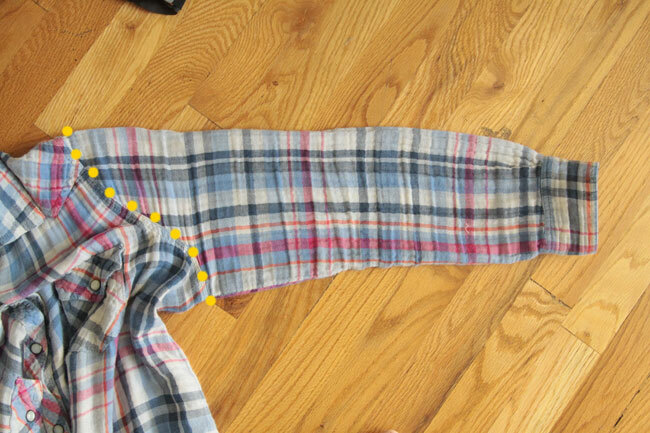 Turn your sleeves inside out and sew them back together along the bottom. 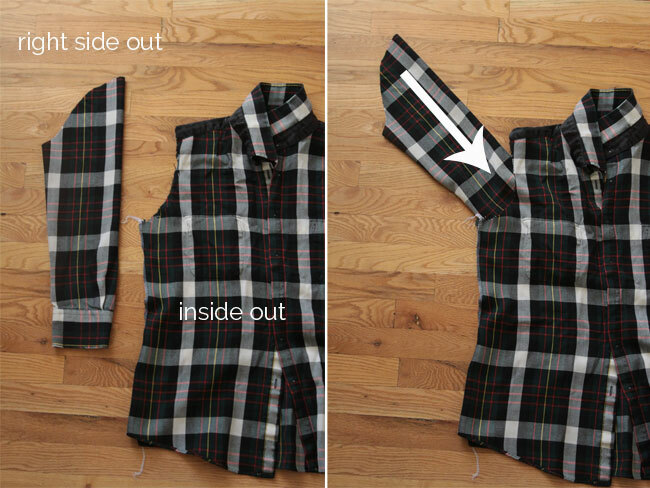 Turn the shirt inside out and sew both sides together. Now all you need to do is set the sleeves back in. Leaving the shirt inside out, turn the sleeves right side out. Place the shirt and one sleeve as you see in the photo below, making sure the buttons on the cuff are down toward the table (if they’re up, you need to switch sleeves). Slide the sleeve inside the armhole, as shown in the second photo below. Match up the raw edges of the sleeve and armhole, easing the material to fit. Pin well, then sew. Repeat with the other sleeve, press your seams, and your new smaller shirt is ready to wear! 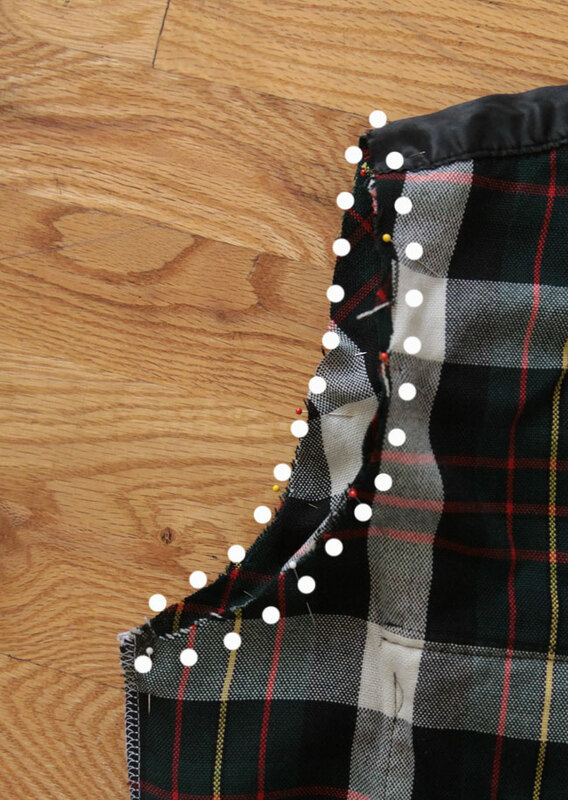 Note: if you’re looking for info on how to size down a pattern visit this post from Melly Sews, . Thanks for the excellent explanation. I have a shirt that also needs to be taken in on the sides. When do you think is the best place to insert that step? How would you do it? I enjoy your blog. Thanks for all the hard work. I am a retired Home Economics teacher, and have taught hundreds of students how to sew. I have been sewing forever, and though I don’t make my clothes from scratch (LOL) I am really enjoying refashioning some of my garments. I want to say that this is by far the Best and Most Clear shirt redo I have had the pleasure to read. Thank you so much! I too sew and though there is a time and place for the down and dirty redo, a button up shirt is not one of them. I learned to sew from a wedding dress seamstress & designer and you can’t tell what she altered because she takes the dress completely apart, makes the changes, and puts it back together again. Bravo for writing about how to property resize a too big shirt, a little extra effort goes a long way. All the blogs I’ve seen say to sew up the arm and bodice and completely neglect the fact that the shoulder will still not fit aka sit correctly on you if it’s too large! Well done my dear. Great tutorial without taking the one that fits apart to do so. i’ve tried several ways, but looks like this is the best, ever. Can’t wait to try it. You gave such clear, easy to understand instructions. Thank you so much! I would suggest adding darts to make the shirt more flattering and fit better. Bodice darts are easy as long as you get them even on both sides. Or you can use darts front or back to pull in the waist just a bit to look more feminine. Other than that great post…oh PS if you use darts front or back they should be made before cutting the shirt to fit your one that you are using for a pattern. Great tute! You should be a teacher. Oh, by the way your modeling and pictures are great too! Did you take in the body of the shirt? That would have been nice to see it and would’ve been a little more figure friendly. Great tutorial! I love everything about it…except the criticism! Ladies, this a shirt, NOT a blouse! A shirt fits loosely and a blouse has the darts which make for curves & a closer fit! She did it correctly and got a beautiful fit, Thanks for the great pictures and details. I thought the your tutorial was super. I, too, have sewn since I was in jr. high. I felt that the tutorial hit all the high notes and you put in just the right amount of time for that article of clothing. I love that shirt by the way, awesome colors. Thanks so much for sharing. This is super helpful. i bought a vintage denim shirt dress online that mostly fits but came from the era of ginormous shoulder pads so the sleeves do not fit. I’ve been trying to figure out what the best way to cut this down to fit right would be and your tutorial is a huge help. You did take in the sides, right? In the photos, it looks like you trimmed down the sides of the body, and re-serged it. Anyway, excellent tutorial, I can’t wait to try this on some shirts. I do have a question…I was confused when you said to add an extra half inch of seam allowance to the back of the shirt only. So when the shirt is laying flat, the back of the armhole will have a half inch more fabric than the front, correct? I just want to make sure I’m understanding that correctly. well done, and still quite simple! I’ll be sure to give it a try. Omg! You are awesome! Thank you so much for posting this. I buy most of my clothes at thrift stores and the women’s flannels are twice the price of men’s. Well done. I was just in my favourite store looking for plaid shirts. None! But the men’s section had their lovely cotton plaid shirts on sale. I tried several on but of course tooooo big. Wish I’d seen your idea then. Will be going back. I think you could use your idea on sweaters, dresses, etc. Wow thank you, just what I’ve been looking for. Great clear and concise instructions. Can’t wait to try this out. Thank you so much for this tutorial! I know just enough about sewing to be dangerous 🙂 My husband has a few shirts he has donated to my cause, and I can’t wait to try your simple method. I love the idea of using a shirt that fits as a template. This is a great tutorial. found it on Pinterest. Thanks! Makes me want to run out and get a thrift store shirt and make one for myself. Super job! I have several shirts that can be made over. Thanks for showing how. I’m trying this out today. Looks so simple! 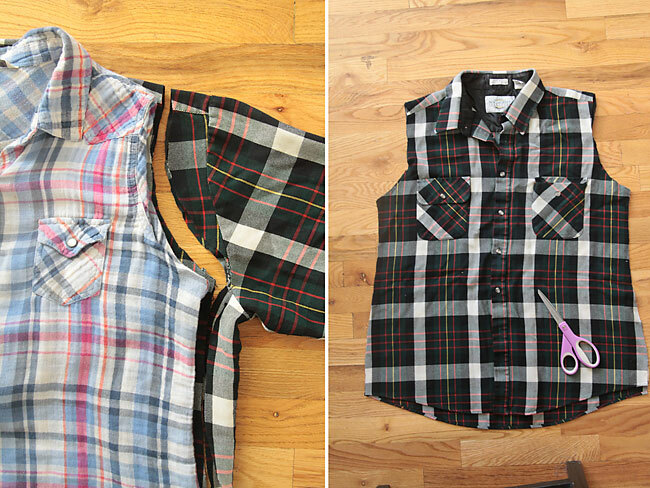 I think this method– leaving the shirt without darts for a looser fit– would be great for masculine-of-center women who have a hard time finding shirts that are cut like a man’s shirt but fit their body. Thanking you in advance! 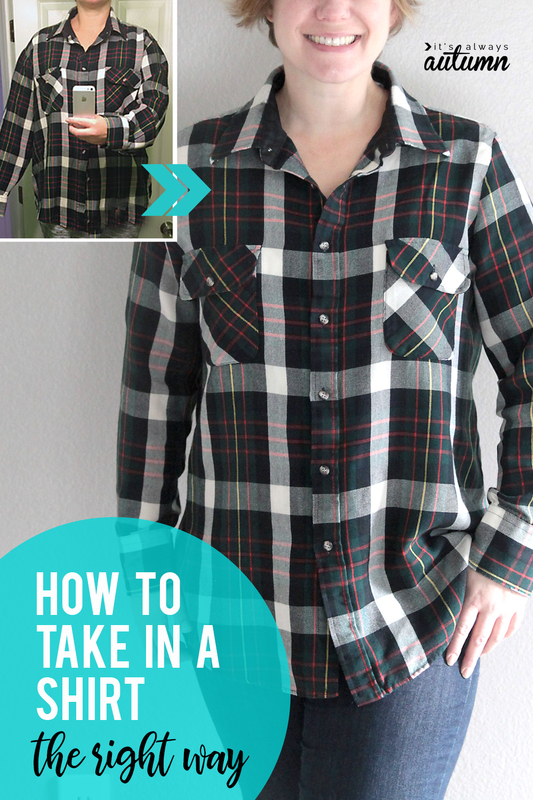 Thank you so much for sharing this – I’ve just refashioned an old shirt and it certainly worked! It was a bit of a fiddle putting the sleeves back in, but then fitting sleeves is always fiddly. The end result is wonderful and I shall most definitely do this again. How do you take in a shirt if you do not already have one that fits? VERY GOOD, THANKS FOR THE TUTORIAL. I LOVE IT. Great tutorial, agree, this type of shirt doesn’t need darts. Yes, the sleeves will be shorter, but generally, if the shirt is too large, the sleeves are too long as well. Thanks for sharing, well written and the photos are great too. I would like to know how to make pants smaller…. I’ve just found your site as a result of searching for easy patterns to use for sewing baby and girls clothes for those who are in shelters. But oh my gosh I found so much more! Thank you so much for sharing so many wonderful patterns, and your tutorials. They are terrific and so clear and easy to follow. I’m just in awe of your creativity and skills. I’ll be following you from now on and will be looking forward to more of your ideas. And I’ll be using so many of your techniques both for sewing for my new project AND for altering some of my own clothes in need of help. 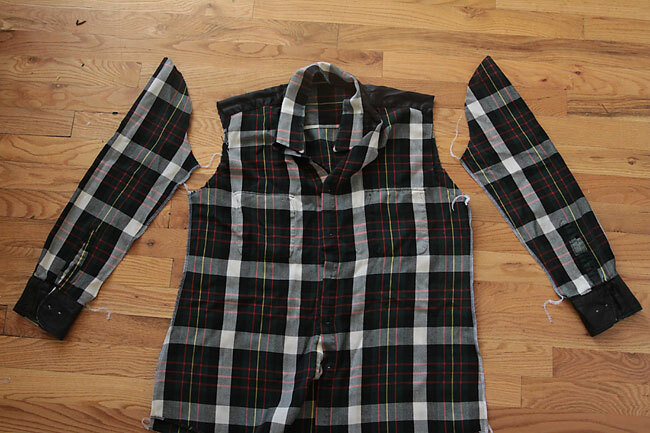 Your suggestion on altering the flannel shirt will be incredibly useful to me! I’ve been trying to take up shirts forever and never been happy with the results since the shoulder seams still fell down and looked sloppy. Yeh! btw, you have beautiful children and I enjoy seeing their little faces and cute expressions. Your comments and funny stories are so much fun and very refreshing. Keep up the good work! Thank you very much for this helpful tutorial… I’m going to try it the first chance I get. I haven’t been too happy with my re-styles lately because of the sleeves and the taking in of the pieces. I love to re-style! Thank you so much for this tutorial. I used this as my very first try at sewing and made a mens XL Polo shirt fit my 8 year old son. I actually impressed people with it! Thank you, again! Will this make the arm holes bigger…I hope. LOVE YOUR DESCRIPTION. I AM GOING TO DO THIS A LOT FROM NOW ON. THANKS MUCH. thanks for the explanation. It sure helps me a lot. Thanks .. simple and straight forward. Such a simple process and easy to follow instructions. Love it! Great tutorial. I just started a new job and the only uniform shirts I can get for a long while are too big so I’m going to resize them! Thanks for sharing how! Great tutorial! The only question I have is about cutting down the sleeves. I understood the “lay out & smooth the sleeve of the shirt that fits”, but think you left out how to actually cut the “too big” sleeve to the correct size. You said to ” not cut through the cuff”…that is where I got lost. Sue from Malaysia here – I made a scrub top according to a sewing pattern and it turned out too big – and many guides said that resizing requires the shoulders to be the right fit before it can be done – AM SO GLAD I found this! The pictures are clear and I knew exactly how this will be the saviour of that scrub top. Thank you so much! Hi from the Philippines! I followed your tutorial twice and got good results! It is an excellent tutorial! You are right, this is the right way of taking in a shirt! My hubby was quite impressed with my new skill at taking in shirts! (I only learned to machine sew last November 2016.) I used large mens’ button down shirts from the thrift shop. You are an angel for doing this blog. I have a teenager who is so picky and I wanted to get her that special shirt for her concert and all her face said was no. There was nothing like this on YouTube. Thanks again. I really like that you said to leave the cuff alone. That’s a great tip. The shirt I purchased was too big and it cost a lot. I wear a lot of thrifted shirts that are too big…. I had thought of a lot of ideas that were more trouble than this, and almost certainly less likely to actually fit than this. This is beautifully simple and beautifully clear. Thank you for the time and trouble you took to make the tutorial for us. Thank you Autumn for these very clear instructions. I’ve just finished resizing a shirt 4 sizes too big for me. I did have a bit of trouble with the getting the sleeve to fit in the armhole, but that’s where a busy print comes in handy to hide imperfections! This was a good practice run for my next project which is a too-large pink linen shirt purchased in an op shop. Picking the right size is important to ensure that you will buy the right shirt without wasting money. Thank for the tips also for remedies in case we can already buy the wrong size shirts. You must realise before you start that the sleeves are going to be shorter when you finish…..
Also make sure that you put the right sleeve to the right side and left to left or your cuff buttons won’t be right. Other than that I loved this project and my blue jean shirt came out beautifully. Very clear instructions.